For most people redecorating their home, the ceiling is often left as an afterthought and is therefore left in a dull colour. This creative guide is to help you think of some ideas, so you don’t end up leaving your ceiling plain and boring. You’ve heard of a feature wall so what’s to stop you trying a feature ceiling? 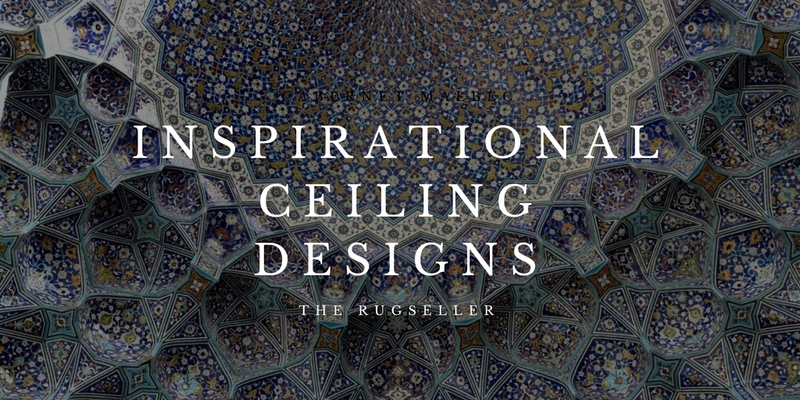 Using motivation from our Inspirational Ceiling Designs Infographic, we’ve had a look and found some ideas to get you started! Whether your style is subtle or bright, old or new, there’s something for everyone in here! 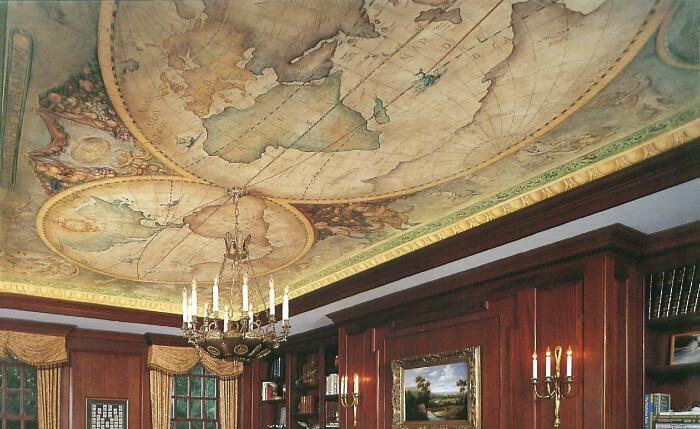 Travel the world from the comfort of your home with a stunning map ceiling mural. This vintage map mural is perfect for the aspiring traveller! This is a superbly detailed textbook style map that is guaranteed to transform a dull ceiling into a marvellous feature in your home. 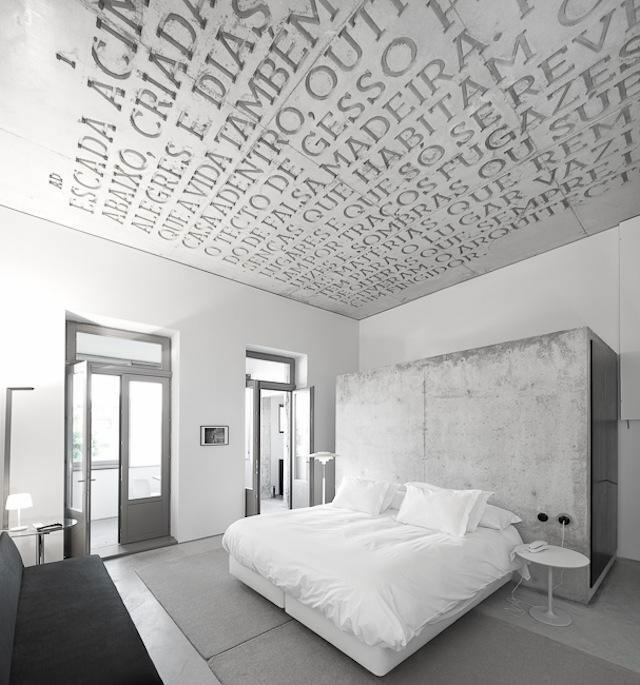 If you love travelling or just great interior decor then this design is a worthy advocate in the search for brilliant ceiling ideas. Transform your living room, bedroom, office or even kitchen with different designs such as world famous city maps and countries for reliving memories or even planning your next trip. If this ancient world map with subtle tones isn’t your style, you could try a more vibrant typographic map. This sort of design would be the perfect type for a study or a room that is furnished using a traditional style of furniture such as mahogany wood draws. Be warned, don’t look up if you’re doing work as you could end up looking at it for hours! Medallions first became popular when they were used as decorative elements in the 19th-century middle and upper-class homes. Since then, they’ve become widely popular and are still used heavily to this day to add the finishing touches to a room. These medallion ceiling designs feature a coloured filling that works excellently with both the room design and the medallion itself. 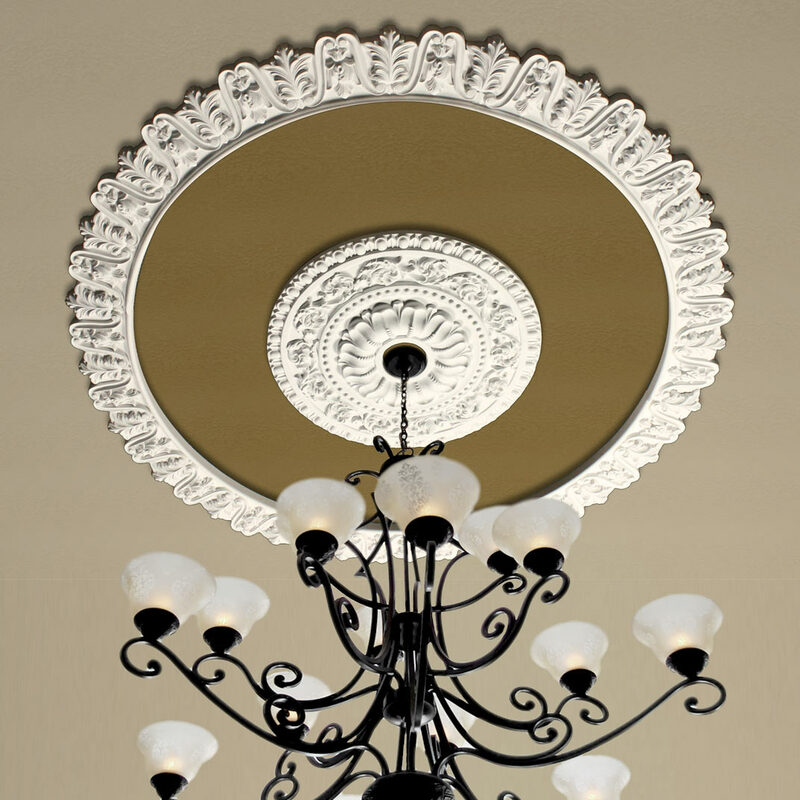 Decorative medallions are a great way to turn those plain flat features of a ceiling into a conversation piece. 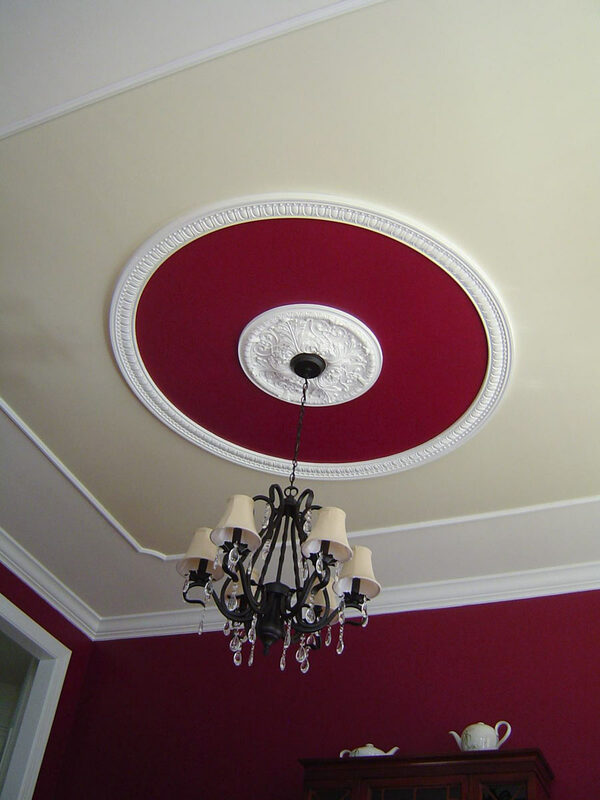 A rich red works well with this medallion or perhaps try a more subtle beige colour. These are probably one of the most well-known decorations as they were so heavily used. You can use one to spice up your ceilings and they can be used in both a modern or traditional interior. Morris’ name and reputation are indissolubly linked to wallpaper and rug design, but there is a tendency to over-estimate the influence he had in this field, at least in his own lifetime. His designs have enjoyed lasting appeal. As Morris’ designs are bold and stand out in any room, they would look so much better than a plain ceiling! He was a massive contributor to the revival of traditional British textile arts and methods of production. 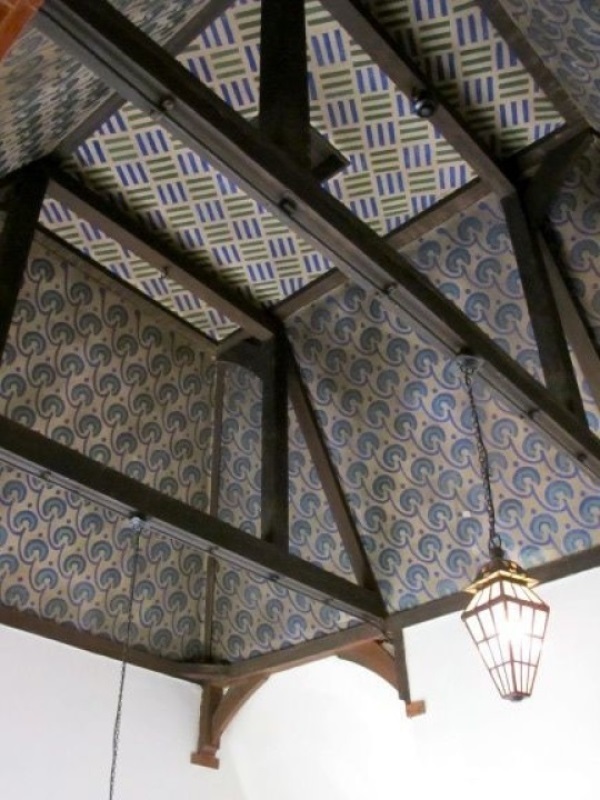 As shown above and below, the use of a decorated ceiling can be the focal point of a room. 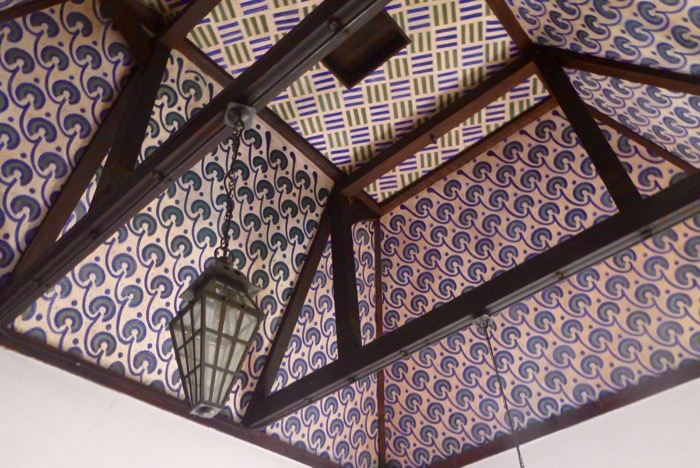 The beautiful William Morris-esque ceiling saturates the room with a pretty print and use of peaceful, coloured hues. Match a design like this with classic marble surfaces, subtle grey panelling and bevel-edged mirrors for a sophisticated vintage look at its best. After reading that quote, why would you ever consider leaving anything in your home plain again? A painted wall may be nice, but it’s not surprising. 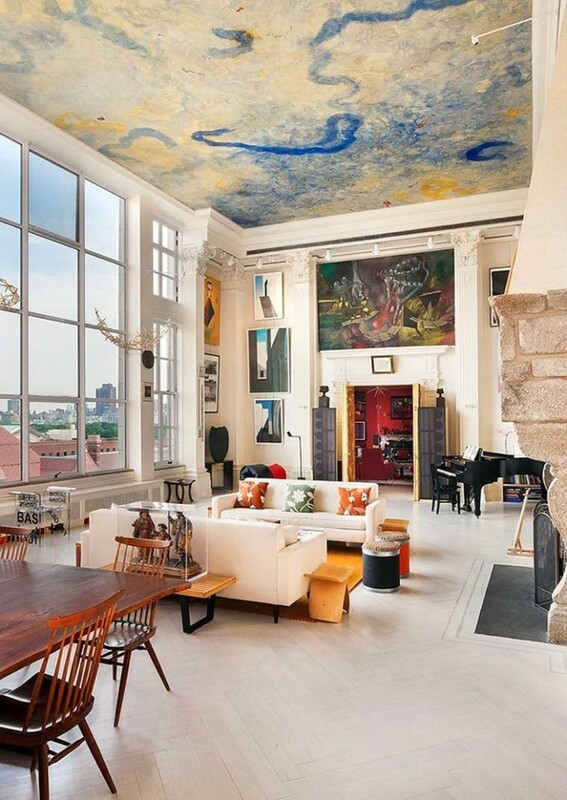 A painted ceiling? Now that’s a little more unusual! 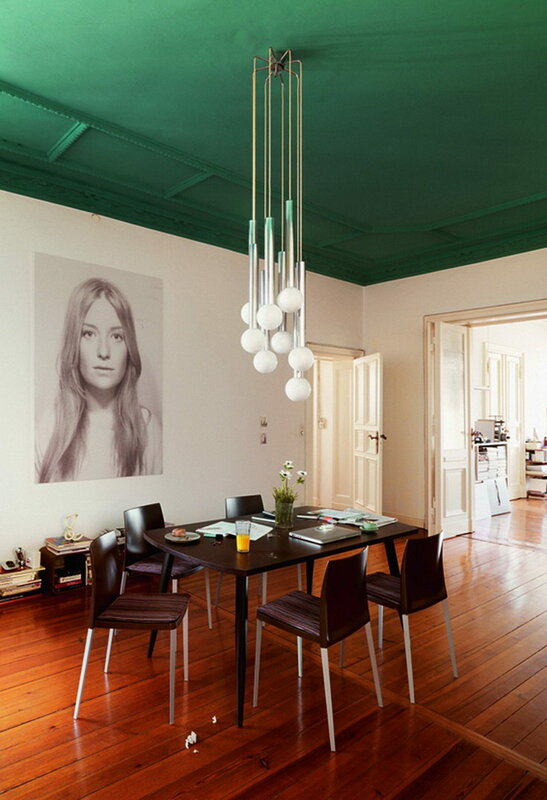 Are you bold enough to paint your rooms ceiling a rich shade of emerald green? An emerald green ceiling shows that modern can coexist alongside traditional if the right sort of furniture and layout is used. If you are not a fan of the green then don’t hesitate to try out a colour that is more your style! Any ceiling coloured other than white or beige is rather uncommon in most households.If you’re bold enough to go for a relatively outlandish coour on your ceiling, there is a good chance that your guests will be intrigued by it. The lighting during the art deco era was sleek and dramatic, with bold but simple lines. Many fixtures were made of glass and chrome, and were etched or enamelled with ancient motifs for additional detail. 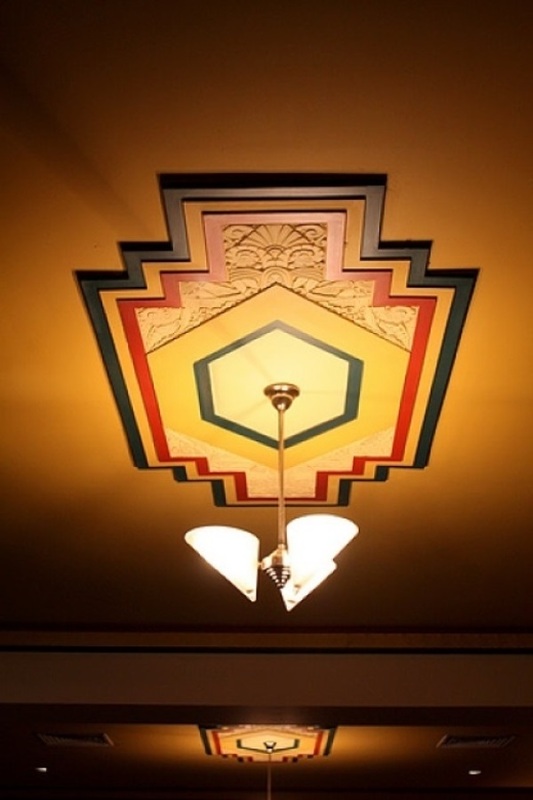 We love this Art Deco ceiling detailing. Get the look: Choose streamlined lighting with clean lines, tapered chrome lamp bases with simple white or cream barrel shades like the ones in this room, and pay a subtle tribute to the art deco era of the roaring twenties. This classic retro design dates back to around the 1920’s. Traditional style furniture made from woods such as mahogany would benefit this style well. While it may look like something from “American Horror Story: Hotel”, it would look excellent with traditional furniture. The art deco ceiling design can inspire you to create a beautiful interior style and add a classy, vintage look to your rooms. Maybe you’ve redesigned your home to look more modern? In that case, a new style of ceiling will be needed. A particular favourite modern ceiling design of ours is the geometric ceiling tiles as they add style to any plain ceiling. 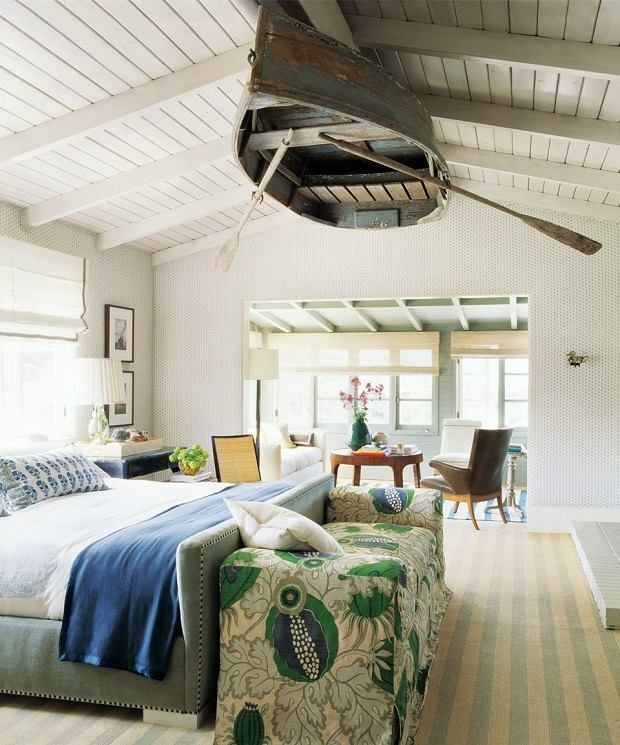 While placing the focal point on the ceiling might not be the first thing that springs to mind, don’t rule it out! 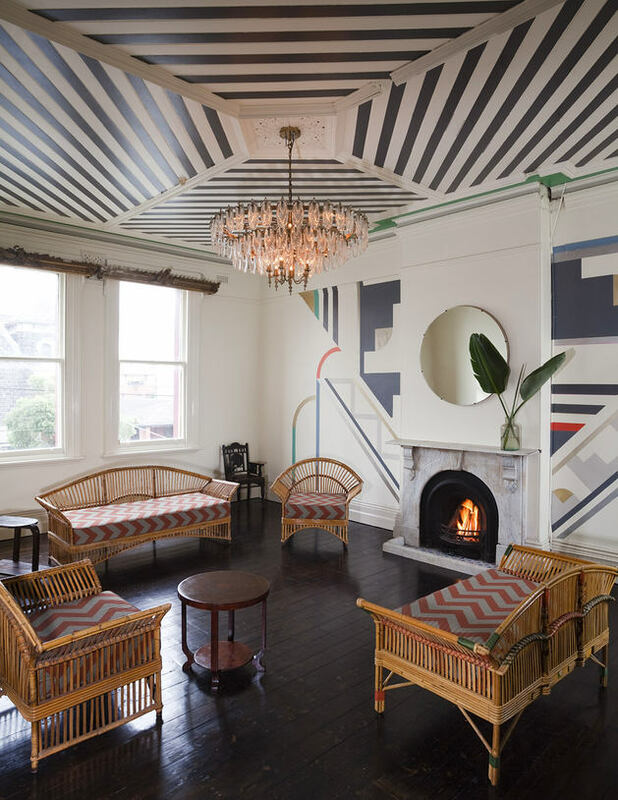 A sophisticated contemporary tile design inspired by the spirit of the old fashioned Deco movement, the geometric ceiling tiles give a twist on the traditional ceiling rose. This stunning, yet mind-boggling piece of decor wouldn’t look out of place in a modern sci-fi film. Furthermore, it allows you to choose to have the rest of your room in block colours which are useful for modern interior design! 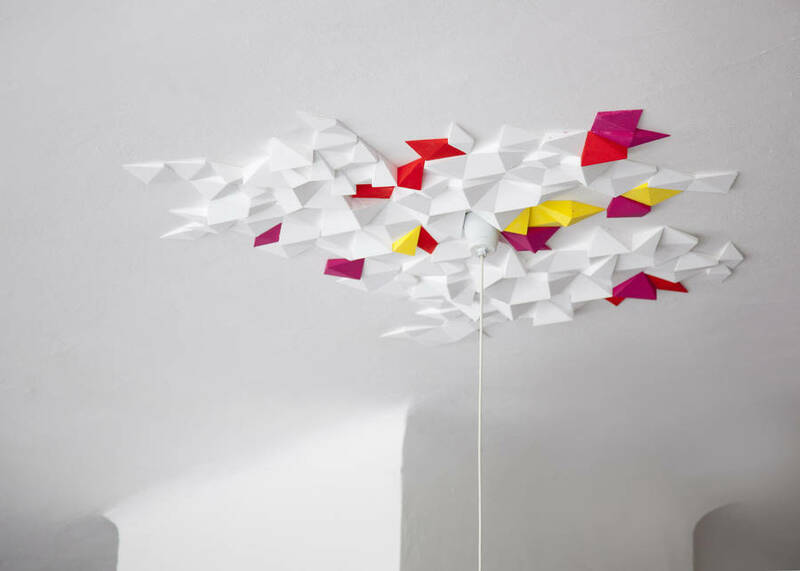 Remember: You can add a splash of colour to your ceiling tiles to make them stand out even more in your room! With its distinctive design, this design makes a strong style statement in a room. 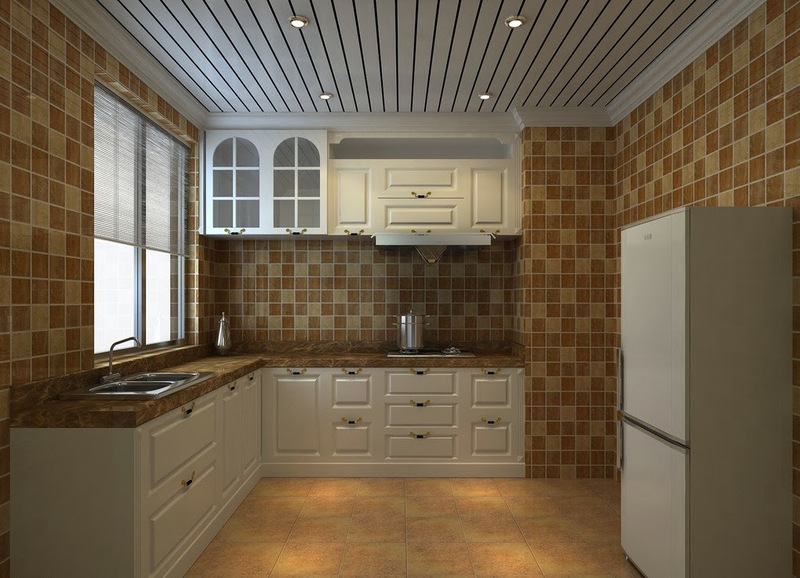 It creates a unique contemporary textured ceiling design and is also perfect for an industrial or rustic style home decor. Make a wonderfully eclectic accent in a modern room, too. This is sure to become the focal point of your room. 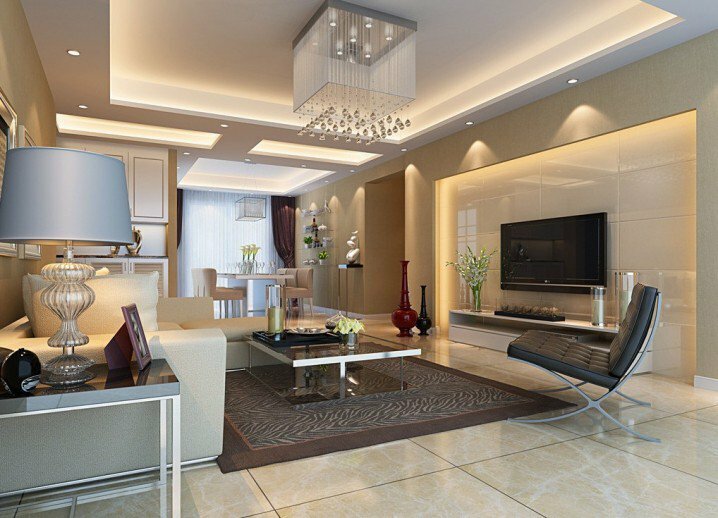 Are you looking for fancy ceilings lights to brighten up your living room? How about a collection of shiny pendant lights to add a splash of colour to your kitchen? Or maybe you’re just looking for a way to add some light to a dark space in your home. If you agree with any of these, then lighting placed into your ceiling is the thing for you! 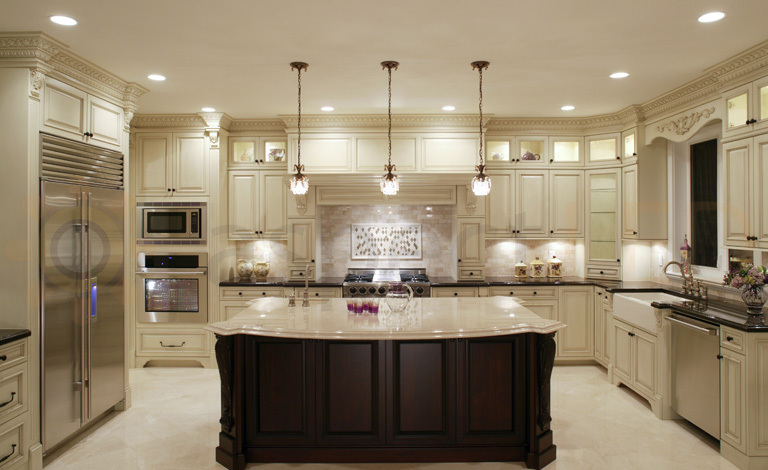 Lights in the ceiling look imposing and are a real asset to any home. Despite their amazing appeal however, nothing is better than natural light. With this said, if your room is unable to make use of natural lighting, artificial ceiling lighting is your next best option. Using lights in the ceiling are one of the best ways to provide as much light to a room as possible as rather than a light being in one spot, it is spread throughout. A creative use of lighting really makes this one stand out. This is would be excellent for a modern style of the room and would really brighten up a place. Moreover, you wouldn’t even need to decorate or design anything to go with it as the lighting does that itself! Remember: These may be an expensive option and it may require architectural solutions. Referring back to the natural light, maybe it’s impossible to incorporate it into your home. 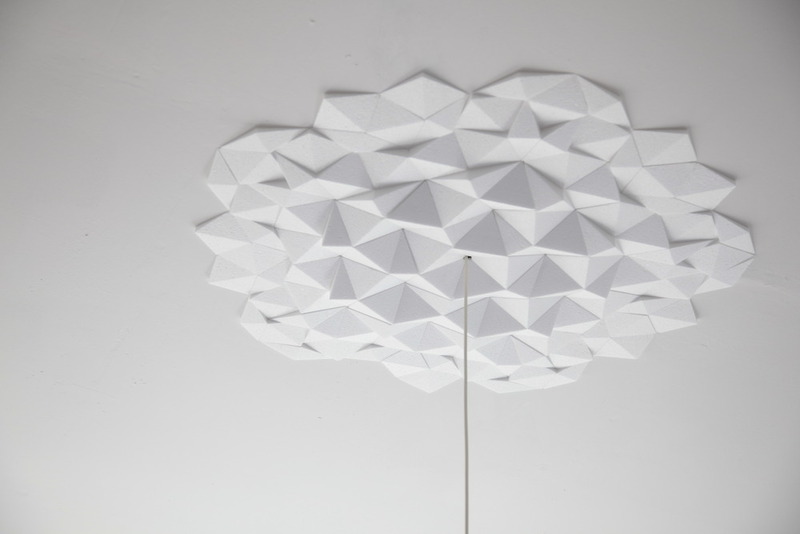 How about using a visually attractive solution as an alternative for dull white ceilings? These ceiling panels by LED Sky Ceilings are an awesome way to incorporate “natural” light into your home by using LED panels to replicate the appearance of a cloudy blue sky. Stripes are very common in interior design. However, they are mostly used on walls, furniture or accessories. 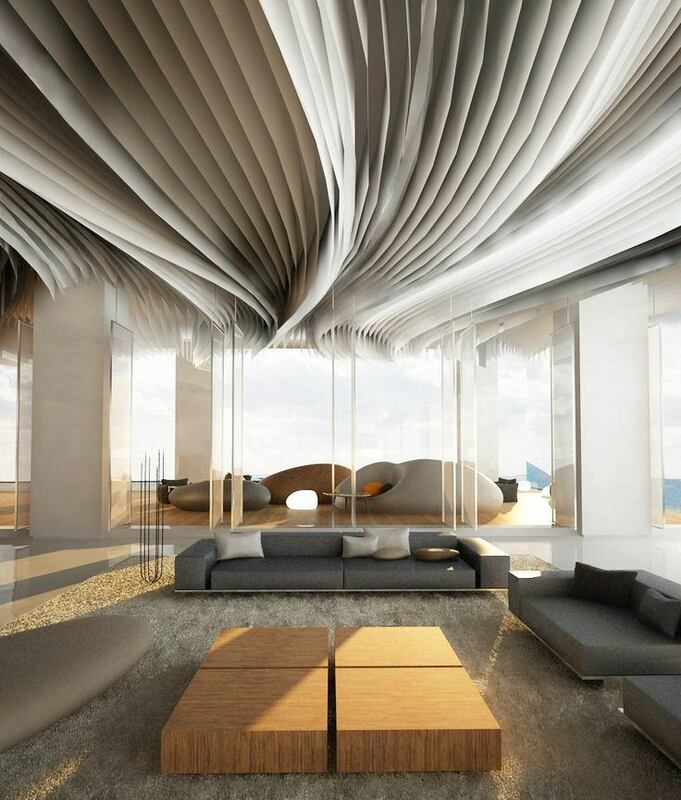 The idea of a striped ceiling is sometimes frowned upon as it seems like it would be difficult to create. As hard as they may seem to do, they aren’t impossible! Stripes have been a staple part of fashion for years, and will most likely continue to do so for a long time. From rugs and pillows to wallpapers, stripes are one pattern that we can always rely on to produce outstanding results and striking spaces. 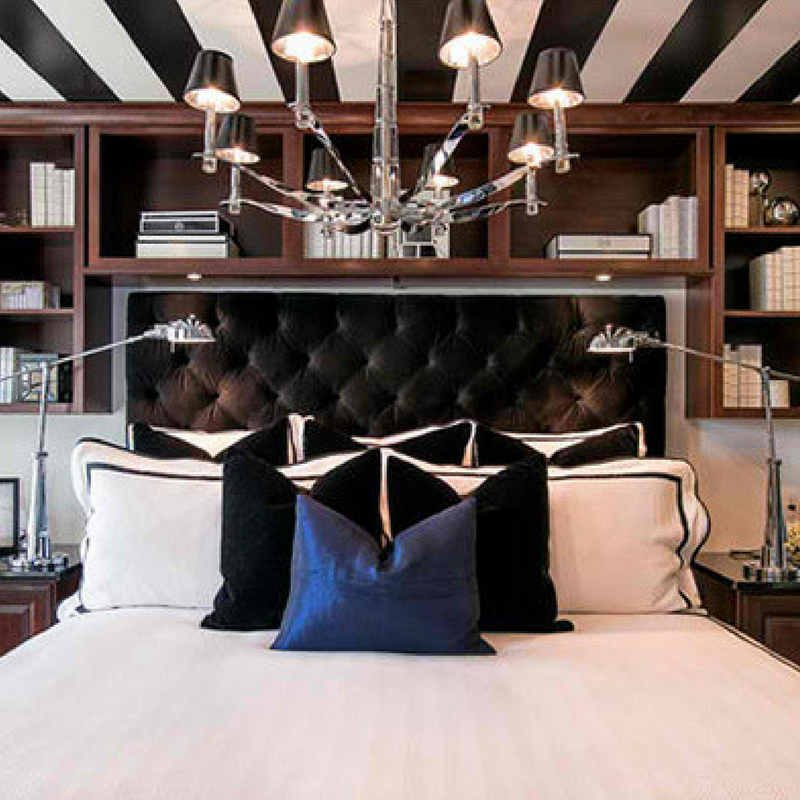 A striped ceiling would look good in rooms such as the bedroom, the bathroom or the nursery. They might be a little too casual or too colourful for the living room and would definitely be too much work for the kitchen. 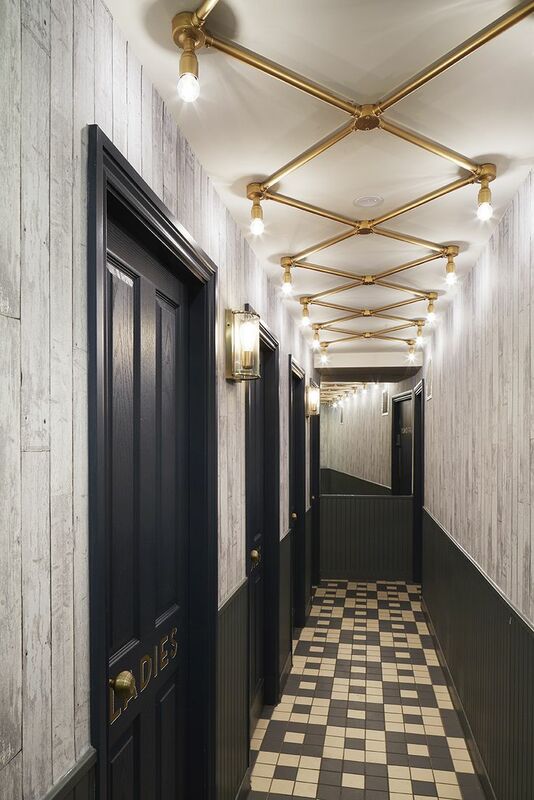 A hallway could benefit from such a spectacular design detail. They would work excellently in a young child’s room and would certainly brighten a room up. Why not give it a try? 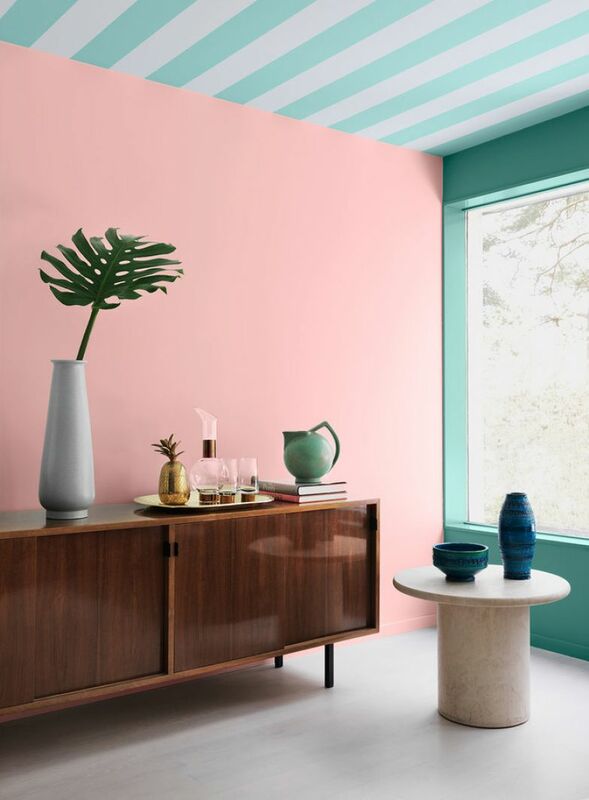 For more inspiration on how to incorporate stripes into your home, check out our Stripes Trend article. Ceiling beams in interior design have an important place. Currently, exposed beams are a fashionable accent in the interior and are widely used in designs and decorations in different styles. Beams are especially popular in industrial or urban loft inspired decors but can also be seen in modern interiors that combine elements of different styles into an eclectic and original home decor. Rustic elements also add a special charm to the overall decoration concept. Exposed beams offer a unique sense of belonging to the untamed nature surrounding us all. One of the grandest design features you can put in any home is an open ceiling with exposed beams. 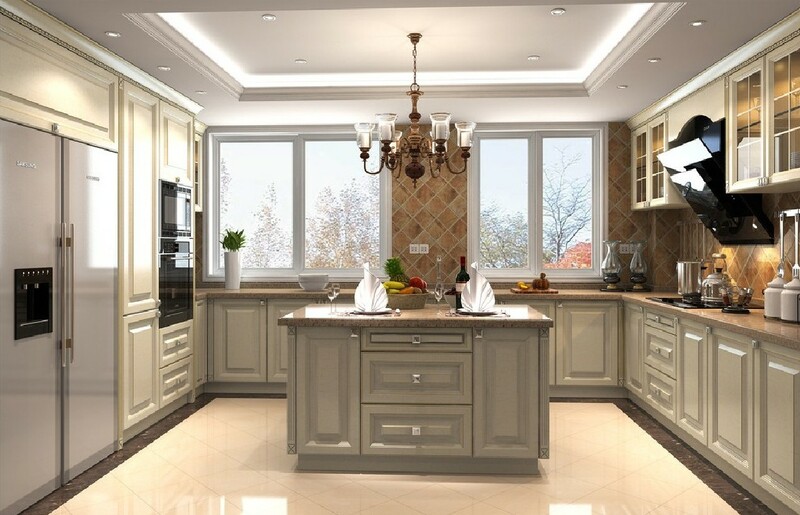 There are many reasons why designers of both modern and traditional homes are choosing this trend. 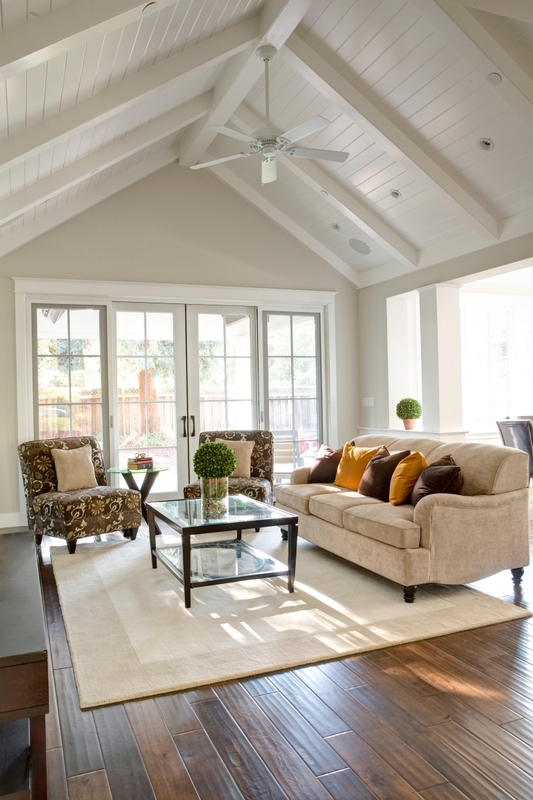 The open ceilings create a large breathable space as well as the extra ceiling height adding light to your home. Reclaimed rustic charm, classy beam design or futuristic expressiveness are just a few ways in which architects choose to reinterpret modern homes with exposed beams. The wooden beams strongly provide this living room with a bold and dramatic appearance. Besides this, the ceiling with exposed wood beams looks aesthetically pleasing and bold. Painting the ceiling a bold or bright colour adds energy and interest to any space. Examples of bright colours are turquoise, orange or yellow. This is a great choice if you have white walls and neutral furniture. 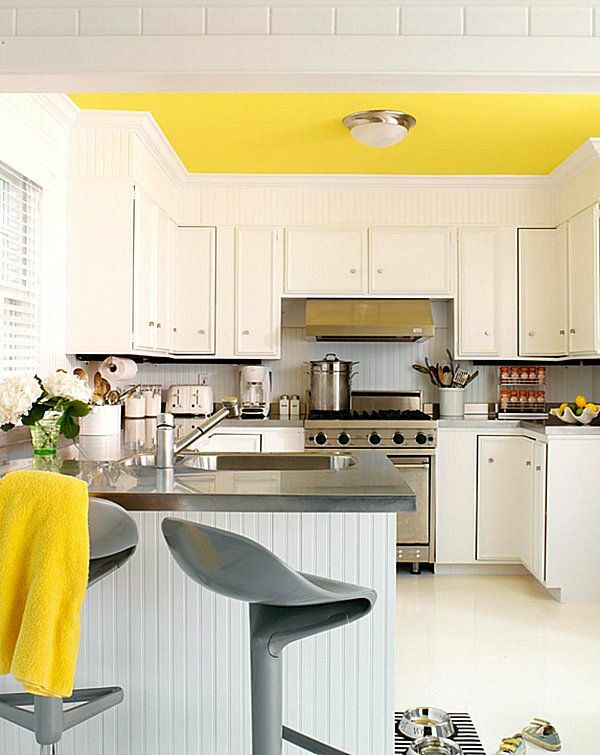 This ceiling features a bright yellow that works great for the kitchen and would certainly brighten up a room! 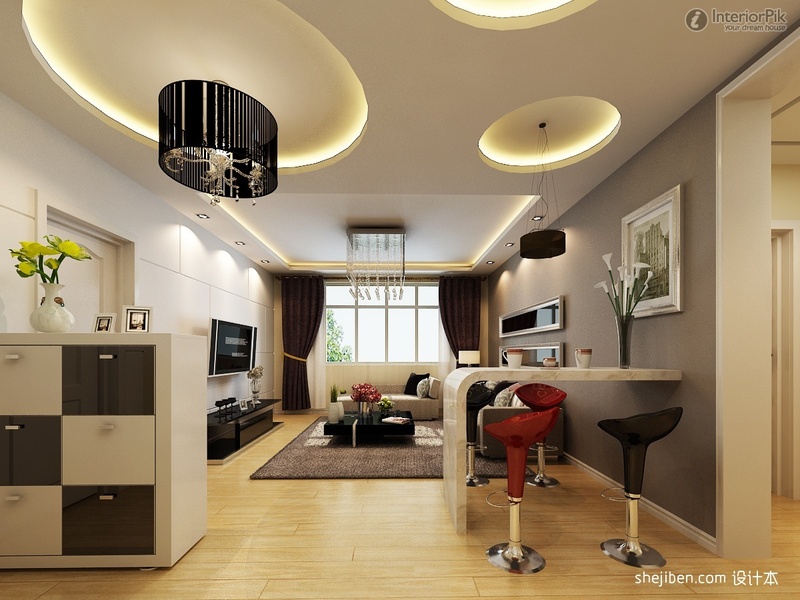 A bright ceiling would also be good for a playful interior such as it would make the room cheerful. Brightly coloured ceilings are perfect for fun, happy spaces, and also terrific in bathrooms or kitchens where the finishes and furniture (tile, counter, floors, tub, sink) are usually white or monochromatic. This room celebrates this often-forgotten surface with eye-catching paint, adding dimension in a refreshing and surprising way. Further accessorising the area with a ceiling light helps make a playful interior and a colourful ceiling stand out even more. We hope that you have enjoyed this post! If you are looking for more home inspiration? Check out our Pinterest boards to get started on your next project. Which design was your favourite? Do you have any ideas for designs of your own? If so, leave a comment below as we’d love to know your thoughts!